KBS President and CEO Yang Sung-dong(left) meets with new U.S. Ambassador to South Korea Mr. Harry Harris. 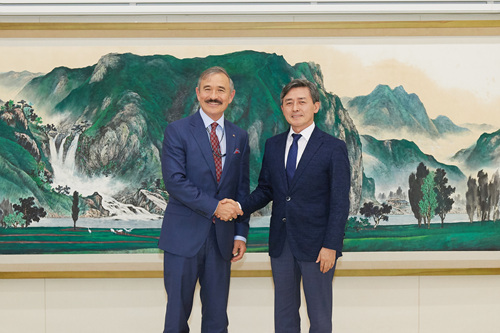 KBS President and CEO Yang Sung-dong(right) poses with U.S. Ambassador Harry Harris. KBS executives pose with visitors from U.S. Embassy. KBS welcomed an official visit to KBS Yeouido Headquarters by the new U.S. Ambassador to South Korea Mr. Harry Harris on August 31, 2018. The former head of U.S. Pacific Command began his role as the new U.S. diplomatic head of mission in South Korea in July 2018. 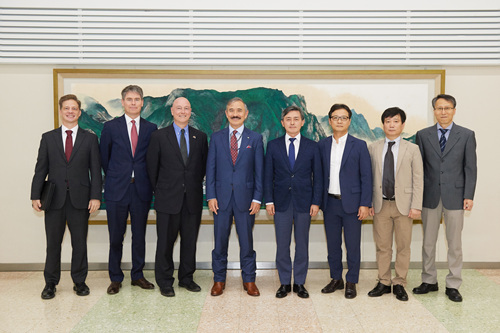 In a meeting with Ambassador Harry Harris, KBS President and CEO Yang Sung-dong said he is pleased to see the new U.S. Ambassador take up the post to serve in South Korea at a critical time for the inter-Korean relations. Mr. Yang said he is looking forward to seeing the relationship between South and North Korea improve and a further step toward denuclearization of the Korean peninsula, and Ambassador Harry Harris will play his critical role in the peace process on the Korean peninsula. Also, Mr. Yang proposed that it would be beneficial if Ambassador Harry Harris could join one of KBS’ current affairs programs like as a guest panelist and share his views on the South Korea-U.S. alliance as well as inter-Korean affairs with audiences. Ambassador Harry Harris said he is well acquainted with South Korea and the inter-Korean relations. He explained that the Trump administration has been continuing efforts to maintain talks with North Korea with new strategies. Also, Mr. Harris said he found the media industry in Korea high energetic and vigorous. Mr. Yang stressed that it is most crucial for KBS to serve it audiences with trusted news as a public service media organization amid the growing prevalence of fake news. He also said KBS is continuing its efforts to remain as the most trusted media organization in the country. The new U.S. Ambassador to South Korea Mr. Harry Harris filled a critical ambassadorial appointment after 17 months of vacancy.